Baltimore, Md. 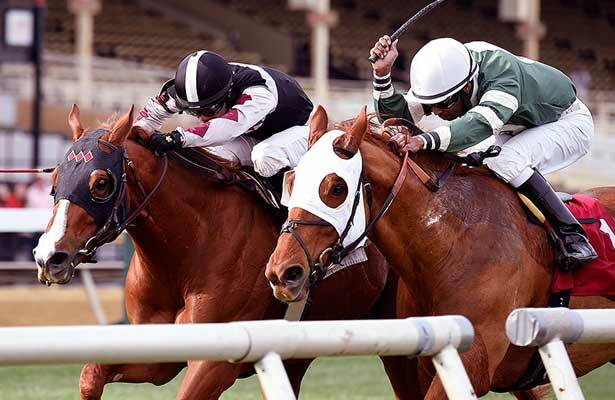 — Sagamore Racing homebred Hamp, four-year-old gelding of Sky Mesa – Vienna Affair (GB), by Red Ransom, today won by a head in the $100,000 Henry S. Clark Stakes at Pimlico Race Course in his third start of the year. He completed the one-mile distance on the on the turf in 1:39.66 and paid $18.80. Javier Santiago was aboard the Ignacio Correas IV trainee, who reached in the final jumps to beat Roadhog, while Nutello finished a close-up third. The victory was the first stakes win for Hamp, and the second stakes win in the last three days notched by Sagamore Racing. Hamp’s half-brother of Daring Dancer, was the winner of the Appalachian Stakes in Keeneland on Thursday, April 17, 2014. Hamp was named in memory of the late Bill “Hamp” Hampton Jr., a close friend to Sagamore Farm.